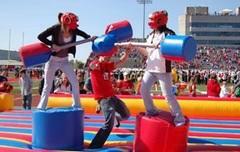 This is our 2 person "Gladiator Joust Arena". The dimensions are 25 Width and 20 Length which allows for plenty of room as players attempt to knock the opposing player off of there pedestal. Super fun!! !